Kidney disease in dogs is a progressive condition that affects up to 10% of geriatric dogs, and some breeds in earlier life as a congenital condition. Fortunately, adjustments to your dog's diet and knowing how to feed a dog with renal disease can help with his kidney disease problems. What is renal disease in dogs? Canine renal disease, or kidney disease in dogs, is when the your pet's kidneys start to malfunction, eventually losing the ability to remove waste and balance fluids in the body. Often this condition causes a complete loss of renal function. In early stages of kidney disease, it may cause acidosis in dogs, as well as prevention of absorption of water, leading to excessive thirst and urination and nutrient loss. In moderate cases, decreased blood cell production can lead to anemia and hypertension can occur affecting the cardiovascular health. As the disease progresses over time, bone health may be impaired in the dog, leading to bone pain and increased risk of fractures. Ultimately, uremic crisis, the inability of kidneys to eliminate waste products from the dog's body out of the blood leading to fatal blood poisoning, may occur. For dogs who have been diagnosed with renal disease, nutrition is an important consideration when looking at this long term. Although kidney disease in dogs is often degenerative, dietary therapy is may slow the progression (1) of the disease and prevent complications of the condition, such as complete kidney failure and potential death, from developing. There is strong research that supports using nutrition as a tool to combat the progression of renal disease in dogs. Specific diets for dogs with renal disease and even kidney failure have shown to maintain or improve nutrient absorption, delay the onset of uremia, slow disease's progression or development of other complications and extend expected life time. Please note that this information is for educational purposes only. Before you get your dog onto any type of specific kidney disease related diet, it's important to consult with your veterinarian and assess at what stage of the disease your dog is. Homemade dog food ingredients for dogs with kidney problems. Note that there are several aspects to consider for the perfect dog kidney disease diet. Let's go through them step by step. All renal diets for dogs should contain carefully balanced levels of phosphate. Phosphorus is an important mineral that is essential for cell structure, energy and bone health. Low levels are associated with adverse health outcomes and malnutrition. Although it is an essential part of the diet, balance is key, particularly when it comes to dogs with renal disease. As this mineral is metabolized by the kidneys, excessive quantities can place strain on the system due to reduced ability to metabolize the mineral. Eventually, poorly balanced diet may lead to adverse effects such as weakening of the bones and calcification of body tissues, including the kidneys. Specific dog kidney health diets contain the optimum level of phosphate and often dietary additives that bind phosphate, allowing it to be excreted through the gastrointestinal system instead of the urinary system. When feeding a dog a renal diet, salt is one of the most important considerations. Animal studies have shown (2) how increased levels of salt in the diet to increase the protein excreted in the urine and markedly increase kidney function deterioration. Similar studies have shown how the reduction of salt intake in dog's diet with kidney problems will slow down the rate of progression of the disease. The bottom line is to decrease the amount of salt, but not necessarily eliminate it. Same as with salt, you'll need to reduce the amount of protein in the dog's diet. For this reason, most kidney-friendly options are often labeled as low protein dog foods. Protein is a vital part of the canine’s overall nutrition which provides daily energy, promotes healing and maintenance of all tissues and cells in the dog's body. However, protein breakdown also leads to toxic waste products in the blood stream that require processing by the kidneys for excretion through the urine. Providing a diet that contains low levels of high quality protein means a reduced amount of waste for the kidneys to process while the pet’s energy requirements are met. Omega-3 and fish oil provide many benefits to dogs, one of which is kidney support. The supplementation of omega-3 polyunsaturated fatty acids has been suggested by vets because studies have shown (3) its protective qualities and ability to slow the progression of renal disease in dogs. Omega-3s are also known to promote blood filtering and support kidney function. Several supplements containing high levels of omega-3s, particularly fish oil for dogs, have been observed to have significantly positive impact in this area. As pets who suffer from renal disease are often geriatric animals, they commonly present with other age-related conditions such as canine arthritis and joint pain. Omega-3 fatty acids have further benefits for these pets as they have been clinically proven (4) to reduce pain and inflammation in dogs suffering from arthritis and reduce the need for analgesia. A healthy balance of vitamins and minerals may also help with the disease. These can be administered to dogs either via foods or through dog vitamin supplements. As kidney disease causes increased urination, dogs often excrete excessive amounts of water soluble vitamins which ultimately leads to depletion of essential nutrients. As a result, this depletion can lead to malnutrition and side effects such as anorexia. Therefore, it is absolutely vital that these vitamins are replaced. Ideally, you should do this through diet but supplementation may also work (although there's little evidence). Specifically designed dog renal diets provide an optimum balance of B Vitamins and Vitamin C, as well as other essential vitamins and minerals for dogs with kidney problems. Hydration is considered an essential objective in management of renal disease in dogs. Kidney disease causes canines to be unable to concentrate the urine. This means that although you may notice your pet drinking more water and liquids, your dog is actually unable to compensate, which eventually causes dehydration. 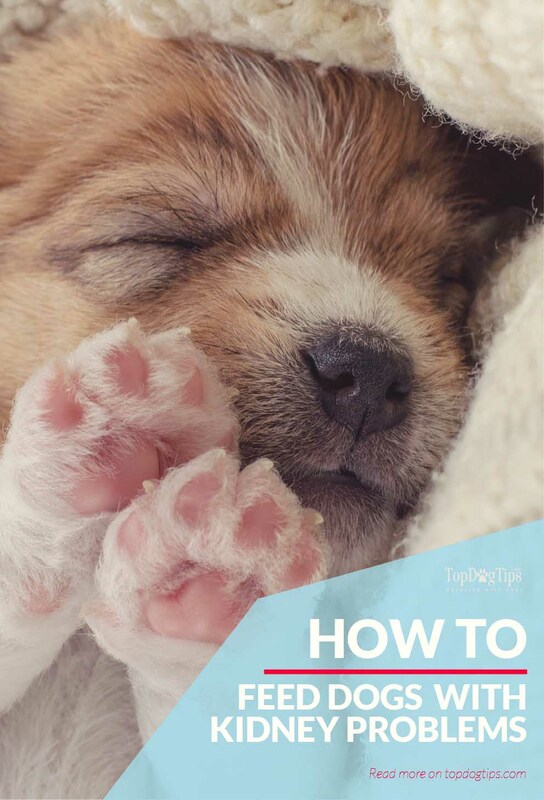 Providing your pet with sufficient amount of liquids reduces clinical signs such as lethargy and weakness, and is also seen to have long-term beneficial effects on renal function. For this reason, many pet owners choose canned dog food that contains more fluids than regular dry dog food. However, it's very important to pick the right type of wet dog food that will also factor in all other aspects related to dogs with kidney problems. Loss of appetite is common in pets who are suffering from renal disease, and getting your dog to eat again can be a challenge. However, as malnutrition in dogs can cause further complications, it is vital that you carefully monitor and encourage proper nutrition and feeding schedule in your pet. Reduced appetite can often be a symptom of this condition. Taking this into account, dog renal diets are designed to be highly palatable to encourage nutrition in order to maintain healthy weight and energy levels. Often, a learned food aversion will occur if a pet feels frightened, unwell or is force fed a new commercial dog food diet, or even a homemade dog food recipe. Thus, try to avoid any bad associations with the food such as simultaneously administering medication. To encourage eating in dogs, attempt to create a comforting environment for your pet when offering his new dog food diet or homemade recipe. The ideal time to try a new diet is in a familiar home environment, rather than during hospitalization. Introduce the new diet to your dog very slowly, gradually mixing the new food with the old, and continue increasing the kidney diet daily until it is the only one remaining. If your pet refuses the new diet, consider another type of renal diet. It is essential that dogs with renal disease continue to eat. It is best to change to another therapeutic diet your pet finds more palatable prior to weight loss and muscle breakdown occurring. Nutrition has long been considered of great value and genuine efficacy for the management of kidney disease in dogs. If your pet has been diagnosed with chronic kidney disease and your veterinarian recommended a special renal diet, there are a range of quality, therapeutic diets for purchase. Before you pick any commercial dog food brand, you must always consult with your vet. This kidney disease dog food is available in dry and wet formulas. It contains small doses of high-quality protein and low levels of sodium. Hill's Science is the oft-recommended dog food by veterinarians for pets with specific health problems, including kidney disease. Low in protein and specifically adjusted to tax the dog's kidneys the least, the Hills R/D dog food also contains high levels of antioxidants, which aim to neutralize free radicals in order to slow the disease progression. Unfortunately, this canine renal disease dog food is only available in kibble form only, but it's a similar although less effective and less recommended option by vets (it is cheaper, however). Purina Veterinary Diets Canine Kidney Function formula contains a nitrogen trap fiber system that aims to reduce nitrogenous waste – the key waste product following protein breakdown that causes renal workload. This system allows the diet to contain moderate levels of good quality protein. This kidney disease dog food is available in dry formula. It contains low levels of phosphorus and low levels of high quality protein, to reduce renal workload. Royal Canine Canine Renal Support formula also has a good amount of omega-3's most important parts, EPA and DHA, that help with regulation inflammation in the dog's body. Again, before choosing any of these diets, please consult with your veterinarian. I also recommend you read the reviews of these dog foods for renal support to see how other pet owners found them and what their vets told them about these dog food brands.